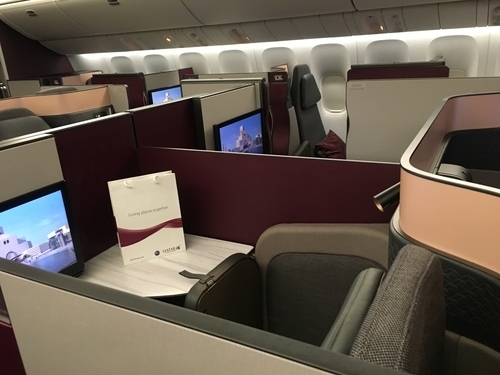 This is my review of the Qatar Airways business class Qsuite ….. sort of. 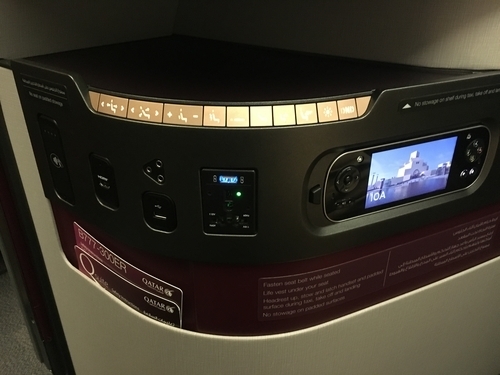 We covered the launch of the brand new ‘closing doors’ Qatar Airways business class Qsuite product at the ITB travel show in Berlin back in March – see here. It is slowly being introduced onto the Qatar Airways 777 fleet, with London a priority route, but I won’t have the opportunity to fly it for a while. 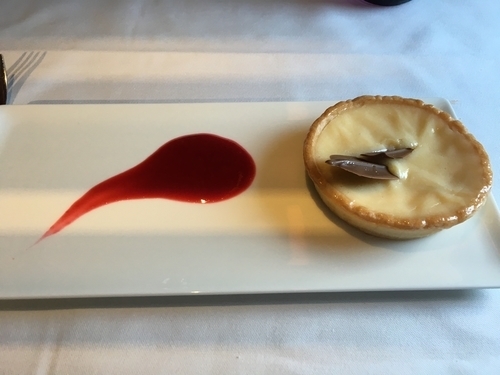 Last week Qatar Airways invited me down to Heathrow Terminal 4 for lunch – in the Qsuite! The airline had jiggled its timetable to allow a longer than usual stopover for the aircraft in London, allowing a group of guests to see the Qsuite at first hand. This is, without a doubt, the most ambitious business class seat on the market – a private suite with closing doors for every passenger. What is most impressive, however, is the way that the layout does not just cater for the solo business passenger. 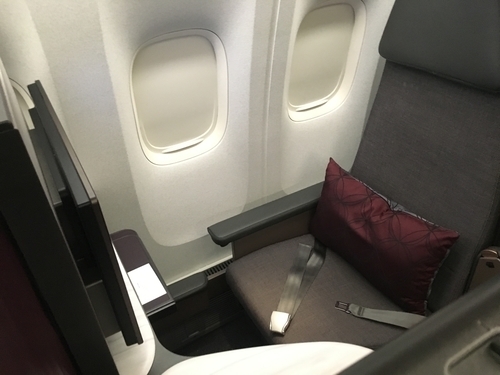 One potential problem with ‘herringbone’ business class layouts, as used by Virgin Atlantic, Cathay Pacific and even Qatar Airways on the 787 and A380 fleet, is that they work less well for a couple or a family. The middle pair of seats face away from each other, which is not ideal for a couple, and there is only a single seat on each side by the window. For families it is even trickier, because herringbone seats – by virtue of being private – mean that you can’t easily keep an eye on your kids. Qsuite works for everyone. 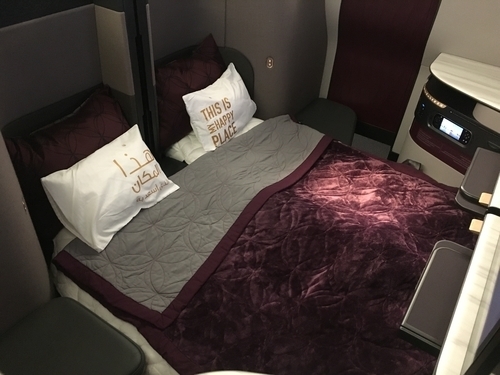 As well as suites for solo travellers, the pairs of centre seats can be converted into either a double bed or a 4-seat suite. From an economic point of the view, the impressive thing about Qsuite is that it takes up no extra space compared to the existing Boeing 777 seat layout. There are 42 suites / seats in the cabin, divided into two mini-cabins of 24 seats and 18 seats respectively. 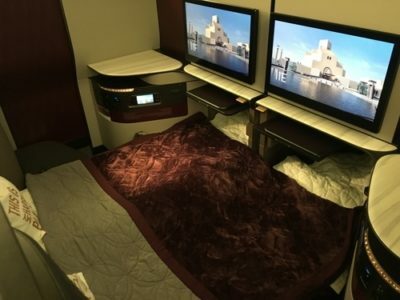 Qatar Airways has been able to swap a standard seat for a full suite, in the same floor space, because your feet now disappear into a cubby hole under the seat in front. The suite itself is not that deep. As you can see, there is a second small IFE screen built into the remote control. There is also a floor level storage area by the side of the seat. Here are a few shots of the lunch we were served. I am assuming that these meals are from the standard business class menu, as they were prepared in the galley from a standard catering trolley. Champagne was Laurent Perrier Brut NV. And that was that! We only had a limited amount of time on the aircraft, as it had to be re-cleaned before boarding began. I didn’t get to test out the recline on the seat. I also didn’t get to see how it felt with the suite doors closed, as they were locked open as would be normal for take off and landing. Popping onto an aircraft for lunch is clearly not the same as taking a 6-hour flight. I don’t think I am pushing the boat out, however, to say that this is clearly a superior product to pretty much everything else on the market. The Qsuite is currently only available on certain London services with Paris and New York launching soon. Don’t be disappointed if you don’t get it, however, as I am also very positive about the A380 seats – especially the private bar – and the A350 and Boeing 787 seats. The original Boeing 777 seats are not great but, of course, those are being replaced by Qsuite. Avios Ireland: Win 1 million Avios when you convert your Real Rewards points! Club Eurostar to launch later this year - what do we think of the changes? 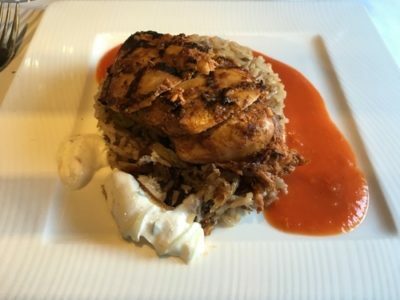 I had the same meals on my BRU-DOH the other day – very good! Great info, thank you! I am looking forward to this with mixed feelings. For me the A350 and 787 seats are some of the most uncomfortable I have used so far. While more or less upright they are great, but with 1.90 I cannot sleep at all as they are just to small in the feet area. I know what you mean – I also thought the old 777 seats were very comfortable to sleep in. In an environment where space is at such a premium, there was something really quite luxurious about having four windows to yourself (or, rather, your pair). That second photo really hammers home the difference. Agreed. It feels like an “exclusive” cabin. Especially the fact you can walk comfortably in your zone. Thank you! I still think the old 777 is their most comfortable offering so I don’t get why these reviewers have to instantly dismiss them across the board. You feel enclosed with the 787 and A380. Especially A380. Great for a day flight. Less so for sleeping. Good to see the backlash against the 777 criticism. I’m sure there was a time when they were lauded as the best thing since sliced bread! I agree with you 100% on this. I have flown the QR A320, 787, A350 and 777 and I like the 777 seats the most. They are the largest by far, feel spacious and for sleeping can’t be beat. The feet space on the current seats is too cramped to sleep properly. Thankfully the old 777 seats are what is on the DOH-AKL route. I’ve done it twice and I’d far rather have those seats than the more cramped newer ones any day. It’s okay if you want to fund terrorism, however I will continue to spend my money (and avios) with BRITISH. It’s awkward isn’t it with them owning 20% of BA. Speaking of awkward, just to check Rob, you are happy to promote the airline of a state with 1.36% of its population in slavery, where homosexuality is illegal and a woman’s guardian decides whether her marriage contract is valid and a law has an article (law 22, article 58) stating it is the woman’s responsibility to look after the household and obey her husband….? It’s the same with the iPhones so many of us use – made in China and so helping to support a regime with appalling human rights standards. And owned by an American company, whose taxes presumably go to support Donald Trump’s government. Time to go and live in the woods, I think. Your point has some validity. iPhones certainly help support an oppressive Chinese regime. Your point on Apple paying tax to Donald Trump’s govt is flawed as Apple do all they can to avoid paying tax in the US, and comparing the odious Donald Trump to Qatar is silly and does not stand up to scrutiny. It is also worth noting that iPhones are items with Apple branding and serve only to make Apple money. 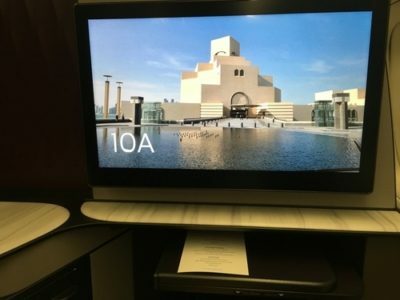 Qatar airlines is a glossy, glamourous, luxurious brand that is designed, much like the World Cup bid, to advertise a false image of a rather unpleasant country. Chris, you have somewhat missed the point. This isnt a case of boycotting an airline, this is about highlighting how a grubby, unpleasant, patriarchal state subsidises its own airline to offer luxury products to Westerners to encourage them to turn a blind eye. It isn’t just airlines, it is football too. Man City, PSG, FC Barcelona, Chelsea, Arsenal and many others take money from the oil states to make them appear respectable. It seems to be working judging on some of the replies. Comparing oil, a necessary product with many applications and zero propaganda value, to a first class seat on luxury airline is a false analogy. Comparing this to a sports team going to play in apartheid South Africa would be valid, as both are seeking to hide the underlying unpleasantness of those states. So your ethical concerns fall away when buying oil because it is ‘a necessary product with many applications’? If you have no problem with transferring your wealth to a country you have good reasons to despise (but are blind to, as you say, when there’s something in it for you), you need to stop telling people they’re ‘missing the point’ and think carefully through your own argument (and apparent hypocrisy). So which model Tesla do you have or have you gone for the Nissan Leaf? Clive, you really have spectacularly missed the point. I’m probably wasting my time with you as you seem to trade in non-sequiturs, but will give it a go. Buying oil benefits all oil producing countries one way or another through providing demand. Oil is a necessity and the consumer has no choice over this and it is facile to argue otherwise. Your jump that I have “no problem” with this is a non-sequitur. I do have an issue with that but no influence among the billions of people who consume oil. A first class flight is the absolute anthesis of a necessity. A first class ticket for an airline that is part of a glossy PR fronting exercise for a country with 5th highest proportion of slaves in the world is as far away from a necessity as one can get. The market of people in the globe who are the audience for this is perhaps in the 10s of thousands. That isn’t even the point though as it is the projection or respectability that Qatar Airlines offers which is the point. Oil does not make a country respectable or admired to the outside world, impressive airlines, hotels and football sponsorship certainly do though. What you have very helpfully shown is that not having any discernment or moral judgement on where you choose to spend your money makes life much simpler. Congratulations, you are obviously proud of the consistency of your amorality. Send your wife and kids with BA then. That double bed arrangement looks superb if one can hook oneself up with a Middle Eastern beauty. Kill three birds with one stone! No pun intended. In that case send your wife and kids with BA! That double bed arrangement looks superb if one can hook oneself up with a Middle Eastern beauty. Kill three birds with one stone! No pun intended. Just to check, you are describing someone pointing out human rights abuses as a troll? It makes sense to talk about boycotting their airline if you have managed to boycott the oil which enriches the country – so if you’re saying this to boast that you have a Tesla and don’t use any plastic products etc, good for you I suppose. Why you would be happy to fly on any airline, given that they are all fuelled by kerosene of indeterminate origin, is a mystery. I think you raise some valid points so don’t think it’s trolling at all. I don’t think it’s unreasonable or loony to have a conscience when flying such airlines. On the flip side, regardless of its dubious regime, I find it rather convenient that the focus is currently on Qatar and not the other gulf states or on Trump’s mates across the border (who I thought he was going to question pre-election). E.g. it is presumably questionable to fly on Emirates or holiday in Dubai. The latter I have no interest in but to others it’s a nice, sterile, convenient environment to go and get some sun and the politics isn’t a concern. Dont forget the metal in your sim card is probably from the DRC. Will, thanks for your reasonable reply. The other members of the ME3 also should have a similar level of scrutiny levelled at them. I don’t fly with them either. KSA is on another level, but Qatar was the focus of the article, hence why I talked about them. I know this is a “fun” site rather than a serious one, so this can be argued to be slightly out of place but I do feel that the football sponsorship and luxury airlines are very much PR stunts by these countries, and the low prices they offer are partially enabled by the 30,000+ slave workers.Some people are aware, others aren’t, so I believe it is valid to raise. My comment was aimed at “DailyMailReader” at the start of the thread. The software used by Rob doesn’t always make replies obvious. So no, not “describing someone pointing out human rights abuses as a troll?”.Pointing out someone who mentions terrorism, and cannot get an airline name correct, as a troll. All your points are quite valid,but perhaps not entirely appropriate on an airline points website. But yes, maybe not everyone is aware of these facts. I presume the conscience of the millions of passengers on the ME3 each year are quite clear, aware or not. Whose parent company are part owned by Qatar…. It is long, polemic exchanges like the one above that drove me to unsubscribe from One Mile at a Time ….. I realise this is a technical point but I think it’s important nonetheless. Virgin does indeed offer A herringbone layout as described (and it’s terrible) but what Qatar and Cathay offer is not the same. They offer a reverse herringbone layout. The difference being is where Virgin’s seats point into the aisles and away from the Windows, the Qatar and Cathay seats point towards them. Where Virgin’s seats in the centre section point away from each other Qatar and Cathay seats angle towards and not away from each other. I completely agree that they’re still not great for couples thanks to the way the centre section between the seats is designed but they’re still a lot better than the abomination in Virgin’s upper class cabin. That is true, and the 1-1-1 Virgin layout is even worse for couples. I find the other half of my couple quite enjoys being cocooned in noise cancelling headphones with a glass of champagne. I try not to take offense. Nope I’ll take Virgin UC over CW any day thank you. And I’m not the biggest fan of the CX, AA, QR reverse herringbone either. Which just goes to show that this is all completely subjective. Having tried both v recently I wouldn’t say the UC experience is a massive step up from CW. Yes direct aisle access but I think that layout is weird especially if you are facing someone you don’t know and it feels like you’ve been chucked into the overhead with a long, narrow seat. Yes, service was better and the CW lounge is fun. I think the CW seat itself (regardless of the other hinderances) is seriously underrated. But again subjective. Hoping to give it a go next year, perhaps ex Paris. How was the legroom space? I always get slight alarm bells after seeing foot cubby mentioned as the space in Swiss Business in the ‘throne’ seat is dreadful – you can’t even turn on your side when lying flat. The main problem is that all this costs money may have something to do with why there haven’t been any proper sales in a while. A very brief and straight to the point introduction. I have been flying with Qatar sometimes and flew with them on many aircrafts. The one i love most is A350 to be honest. I enjoyed the A380 with the private bar but unfortunately, in the last 3 times when i flew with this aircraft, there are so many children’s on board and running up and down the bar area. I look forward to the Qsuite flight i will be experience in Feb 18, which is exciting for me. Just managed to bag 2 Virgin UC returns from Las Vegas this February on the 747 (first time for us)! Couldn’t get the front row, but got row 2 instead so hopefully can talk to my OH a bit before we sleep, or perch on the (tiny?) ottoman seat. Looking forward to comparing with BA Club (on the 787 on Monday to New Orleans)! Rob – any comments on the recent AmEx reward cards that were made available in the UK? They’re just the same as the gold credit cards that have been available through some price comparison sites for quite some time aren’t they? Nope! These are different. These are credit cards not charge cards and can be held without paying any annual fee (the gold companion credit card is only available to holders of the pref rewards gold card, or those willing to pay an annual fee after the charge card is cancelled). I currently can’t justify paying the annual fee for Amex Gold (nevermind Plat) so these will be really handy for me. Although it seems this might be a case of cannibalisation of the BA Amex! Monday. I am now allowed to cover them by Amex. Is there any suggestion that these can be opened (and sign up bonuses obtained) at the same time (or within 6 months of) an alternative MR-earning card (e.g. Gold/Plat)? Looks like that won’t be possible. Do you not rotate the PRG gold, at least it’s fee free in year 1, with the cheaper SPG? Can def rack up the miles on those at least. Whatbwillmyou earn on these new Amex cards then? Just arrived in Tokyo. Flew QR8 QSuite LHR-Doha. The seat is quite similar to Emirates First but thankfully no bling. I found the enclosed seat area quite cramped i noticed my neighbour managed to unhinge the slide door which was quite funny! The service as always was fantastic but i still prefer the 777 old seats as they’re very spacious and comfortable. I slept for 7hrs on QR806 DOH-NRT. Good to hear that I’m not alone in preferring the current 777 seats. Best pairs for a couple on all the airlines my wife and I fly. 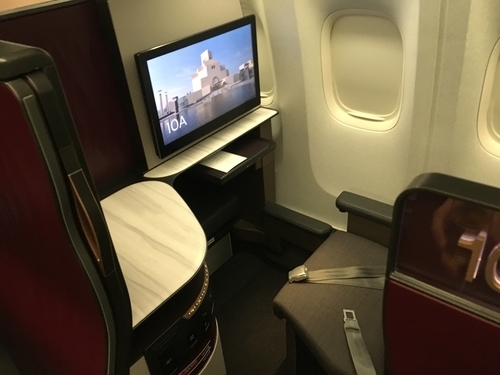 I’m flying Doh-lhr on 777 with Qatar on 21 Oct. Will it definitely be q-suite? Nothing is definite with Qatar. Rob, I had the pleasure of Flying on The Q suites LHR to DOH , out on the 16th September and back on 26th September. Superb product IMO. Excellent service. 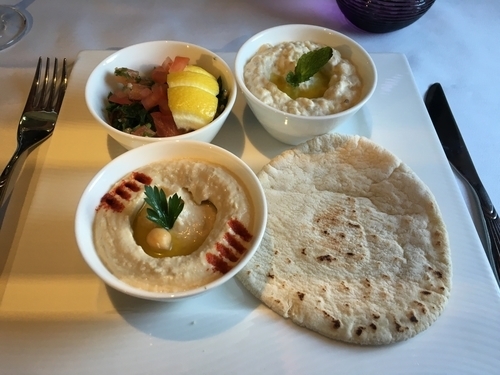 Great product very similar to the leased Turkish airways first class suites ( when they leased them from Jet airways). The crew admitted to me that as the plane is so popular, business class tends to be full , making their job a lot harder.